Fall Grilling Ideas And Why We Love Autumn! Who says the summer is over? Well, informed, educated, knowledgeable people do, actually — seeing as how the autumnal equinox was this past week. While we are more solstice-folks ourselves, we never turn down the opportunity to topically include the word “equinox” in a blog. With the season’s change comes new colors, lower temperatures, warm blankets, more evenings indoors, kids going to school again (thank heavens), and of course, an entire new set of grilling ideas provided to you by your trusty and local propane supplier here at DiSanto propane. But before we offer up a few of the many things you could grill using perhaps the world’s most clean, effective, safe, and energy-efficient fuel source (propane, obviously), allow us to list the things we love about autumn, aside from mentioning the word “equinox” a weird number of times. Delicious Fall Baking – It might have come to your mind first, just like it did ours — there are so many things to love about fall baked goods. From pumpkin pie to apple pie to sweet potato pie and all the other pies, ‘tis the season for gaining weight folks. And that’s okay. Pretty fall colors – We live in an amazing part of the world, don’t we? We aren’t sure if there is a better place to live if you love watching the fall foliage turn from green to different shades of yellow, orange, and red. Baseball Playoffs – It’s America’s past-time, ladies and gentleman, so excuse us if we include it in our list. The Yankees and Red Sox both have stacked lineups and are in the mix, and the National League pennant race is going to come down to the wire. Tune in! Apple Cider And Other Hot Drinks – Who doesn’t love hot apple cider? If you are among that minority of folks, we bet you love pumpkin spice, hot chocolate, tea, or maybe some eggnog? Too early for eggnog? Well, you’ve got to curl up with a blanket, good book, and some sort of hot beverage — it’s one of our favorite parts of the season! The Holidays – Maybe you love Thanksgiving, maybe you love Halloween, or maybe you attend your local Church’s Harvest Fest while all the other kids are out Trick or Treating. We don’t really care which camp you belong to, because there’s something for everyone to enjoy when it comes to fall holidays. Look out for a future post in which we talk about what kind of Thanksgiving foods you can grill with your propane grill, in case you’d like to mix things up a bit this year! Football – Whether it’s the Friday night lights of your local high school team, the state school’s, or the New York Football Giants, football and fall go together like coffee and donuts. Oktoberfest – We recommend heading to Germany at least once in your life in order to experience the wonder that is Oktoberfest. Munich draws over 5 million people each year! But since it’s not financially feasible for everyone to do so, we’d like to point out that you can celebrate the same kind of event a bit closer to home if you’d like to. Of course, you could just grab a six pack and grill some burgers from the comfort of your own home and title the evening’s proceedings as your own personal “Oktoberfest,” and we’d respect you for it. Fall Festivals – You might love corn mazes, you might love pumpkin picking, or you might be of the germ-spreading ilk and enjoy an old-fashioned apple bob. Fall festivals are glorious and everyone should attend. Amen. Alright, that’s enough autumnal musings for one blog post — especially a blog post that isn’t really about things we love about fall. It’s about fall grilling ideas using your propane grill. Let’s dive in! If you’ve never had authentic baba ganoush, we feel sorry for you. But here’s some good news, you can make some incredible “baba” on your own — even if you’ve never experienced the joy of tasting the Middle Eastern condiment in your life! Just follow this recipe by bon appetit. It takes a few sweet potatoes, tahini, garlic, lemon juice, salt and pepper, and then some special seasonings that we don’t think should be (too) difficult to find. Oh, and make sure you don’t forget the pita bread! It’s a wonderful dip that blends a fall classic with some unexpected flavors. Most people know pork goes well with apples, but why is it that most of us take the opportunity to marry the two? Perhaps it’s because we aren’t sure how to appropriate the apples in the right way, maybe it’s because we don’t have enough time on our hands to make something special — we aren’t sure. Luckily, this recipe takes care of both of those issues, as it doesn’t take much time to prepare and it’s fairly simple as well! You’ll need some pantry spices along with dark brown sugar, Dijon mustard, and some apple juice concentrate for the apple-bourbon glaze. It should take less than an hour in total to prepare. And that’s us being serious with the hour estimate; not like some of these recipes that say it’s easy and will take 10 minutes but you end up spending forty-five minutes with prep work on your hands and the guests are about to arrive and you’ve barely thrown the dish into the oven…we digress. If you are looking for a side-dish idea to go along with your grilled protein, we feel your pain. You can only grill corn on the cob so many times. But not to worry, we are also here with a solution. This Cheat Sheet fall grilling recipe offers up an exciting twist on what many consider mundane — the salad. To be fair, grilling makes just about anything more interesting and taste better, not that we are biased or anything. Feel free to swap out other veggies with what you might find at your local farmer’s market, but this recipe calls for chives, basil leaves, garlic cloves, champagne vinegar, sugar, olive oil, tomatoes, sweet onion, eggplant, red bell pepper, and an ounce of olives to boot. This one won’t take too much time either, but it’s not a five-minute recipe — ye be warned. We’ll also say it’s worth it, so give it a shot! Aside from the incredible blog posts, great grilling ideas, and 76 years of being an Upstate New York propane supplier, there are a few other reasons to choose DiSanto to be your distributor. Namely, we offer great prices and stable, fixed billing through the year. For folks who are interested in propane services for the home, being able to count on a consistent bill (rather than one that spikes in the fall and winter) is huge. And the same thing can be said for our commercial propane customers at that! Beyond that, we’ll have to save additional reasons for a future post. The long and short of it is that propane is wonderful, and we’ve got it. We want to give it to you at an affordable price, too. Become a DiSanto Propane customer today! 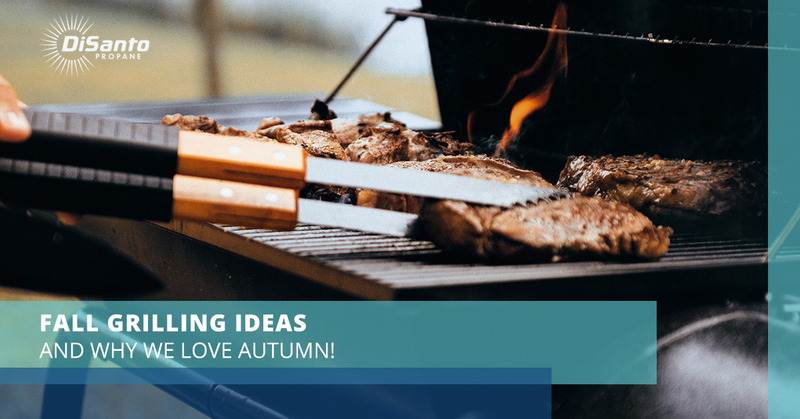 By DiSanto Propane| 2018-10-04T12:56:58-04:00	September 26th, 2018|Home Propane New York|Comments Off on Fall Grilling Ideas And Why We Love Autumn! We are dedicated to great customer service. If you have a question or concern, please contact us. Propane Tank Exchange In New York – Why Mighty Flame?